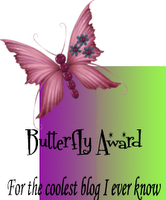 I want to thank all my blogging buddies Suma Adlak's Kitchen, AnuSriram who have showered me with Friendship Award, Hard Working Food Blogger Award, Good Job Award, Inspiration Award, Butterfly Award, and Chocoholic Award ..wonderful awards. Thank you friends,for this wonderful awards. I feel honored. Ramya Vijaya kumar Passed me Good Job award. Vidas Passed me Friendship Award,Hard working blog award.Thank u Ramya nVidas. I feel honoured and happy. Thanks a ton for all of u.
I would like to pass all of these awards to all my fellow bloggers.All are deserve for it. 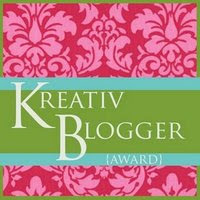 Purva has shared with me Kreative Blog Award& tagged me with 7 Meme.Purva Thank you for sharing this lovely award with me. 5. Walking, for an hour in the evening. Then observing birds,watching sky n stars. (It is my favorite hobby This i do now n before). 6. After dinner, I talk and discuss A toZ with my kids& hubby. 7.Before going to sleep Listening classical music & reading books. (This I do now n before). 3. Continue my teaching till my life time. 4. Learn driving & own a car. 5. Visit to my native place and seeing my mom & brother.. it has been nearly more than 5 yrs. 6. Continue blogging and make many more friends . 5. Jangri & rasmalai are my favorite sweets. Congrats on your awards, and very nice to know about you. I am late but you are welcome to my blog for collecting it again. Nice to know more about you. Surely will tag this, but give me some time ;) will do it next week! I enjoyed reading your tag, done beautifully. Nice job. Good reading your Meme nice to know so much abt you.congrats on all your well deserved awards and thanks for things of me,really appreciate it. Congratulation! Nice knowing you. Take care. Hi Jaishree..congrats on your awards!!! Thanks for stopping by at my space..
thank u soo much for selecing me amog ur list...i am flattered.. Thanks Jaishree for showering me with the awards:) Nice to know more about you. Surely will do the tag.